California Governor Jerry Brown signed landmark legislation Monday committing his state to a 100 percent clean electricity grid by 2045. At least 20 countries and twice as many large cities have made similar pledges, but California -- the fifth largest economy in the world -- is by far the biggest jurisdiction to do so to date. "This bill and the executive order put California on a path to meet the goals of Paris and beyond," Brown said at a signing ceremony in state capital Sacramento. "It will not be easy. It will not be immediate. But it must be done." On the international stage, California has emerged as a leader on climate action as US President Donald Trump has opted out of the landmark 2015 Paris climate treaty and moved aggressively to dismantle the policies of his predecessor, Barack Obama. "California, as a very prosperous economy, is taking aggressive action on climate change," Brown told AFP by phone when asked if the new measure will inspire others. "So I hope it gets France and Germany to up their own ambition, because we all have to do more than we are currently doing." The electric sector represents 16 percent of the state's greenhouse gas emissions. More broadly, California has set ambitious goals to slash greenhouse gas emissions 40 percent by 2030, compared to 1990 levels. Among the co-chairs is China's former chief climate negotiator, Xie Zhenhua, reflecting the strong ties that California has forged with the world's largest carbon polluter -- at the national and provincial level -- around climate action. 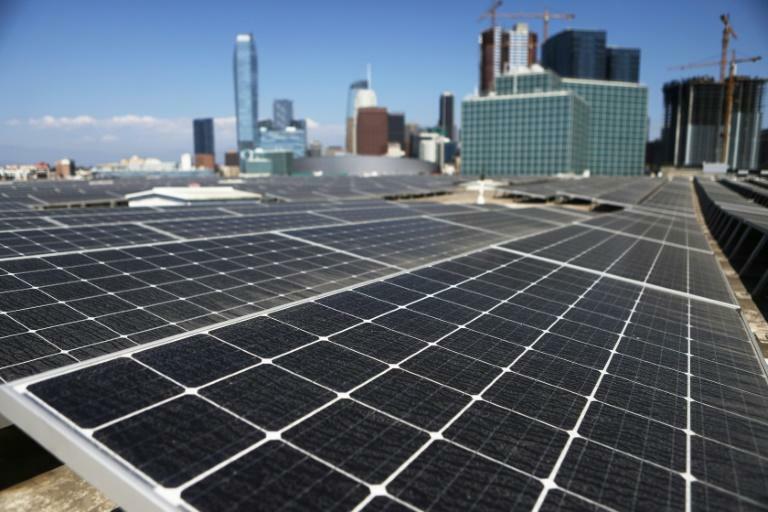 "It's impossible to overstate how significant it is for a state as large and influential as California to commit to 100 percent clean energy," said Sierra Club Executive Director Michael Brune. "California is showing the world that a transition to 100 percent clean energy is within reach." But Brown cautioned that reducing emissions enough to meet the Paris goal of capping global warming below two degrees Celsius (3.6 degrees Fahrenheit) remains a daunting task. "Have no illusions," Brown said. "California and the rest of the world have miles to go before we achieve zero-carbon emissions." As the measure was unveiled, UN Secretary General Antonio Guterres warned of a "dark and dangerous future" under threat by global warming. "If we do not change course by 2020, we risk missing the point where we can avoid runaway climate change," he said in a speech at UN headquarters in New York. Scientists estimate that the global economy will have to become "carbon neutral" -- removing any additional CO2 put into the atmosphere -- by mid-century or shortly thereafter to avoid catastrophic climate impacts, including deadly heatwaves and superstorms engorged by rising seas. Utility and oil companies resisted the legislation, arguing that it would lead to electricity price hikes for consumers and have negligible impact on cutting CO2 emissions. This leaves the door open to carbon-neutral power generated by nuclear reactors, geothermal sources or even natural gas, if CO2 emissions are converted into fuel or syphoned off into secure storage underground, a technology known as carbon capture and storage. The outgoing governor, 80, first proposed renewable legislation four decades ago during his first stint as California chief executive, earning him the nickname "Governor Moonbeam." "Brown really launched the modern renewable energy industry when he was governor the first time," said Jim Williams, a professor of Energy Systems Management at the University of San Francisco and author of a seminal 2012 study that mapped the decarbonization of California's economy by mid-century. The governor told AFP that he still had "much to contribute". "I want to work on climate change issues, and I want to work on bringing some sanity to the nuclear arms race while I still have time."